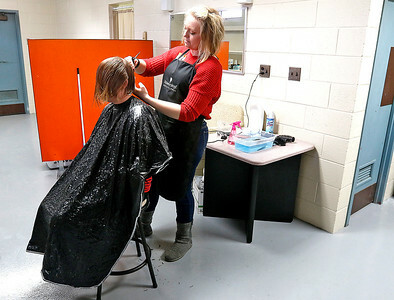 H. Rick Bamman - hbamman@shawmedia.com Volunteer stylist Erica Zarnstorff (cq) cuts a guest's (that did not want to be idenetified) hair at the Woodstock warming center in Woodstock on Wednesday, Feb. 24. 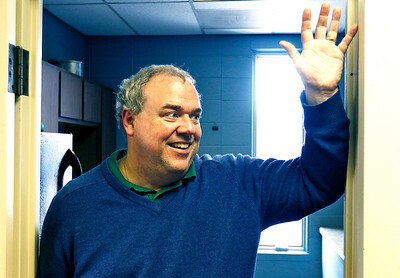 The center is open Wednesdays from 8 a.m. to 6 p.m. and offers the homeless an opportunity to eat, sleep and shower. 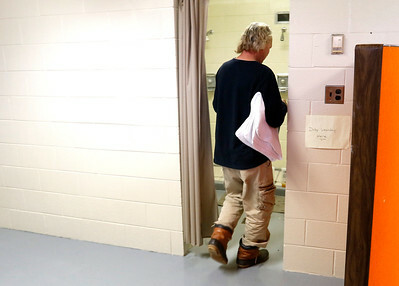 H. Rick Bamman - hbamman@shawmedia.com A client sleeps at the the warming center in the old Woodstock Fire House. 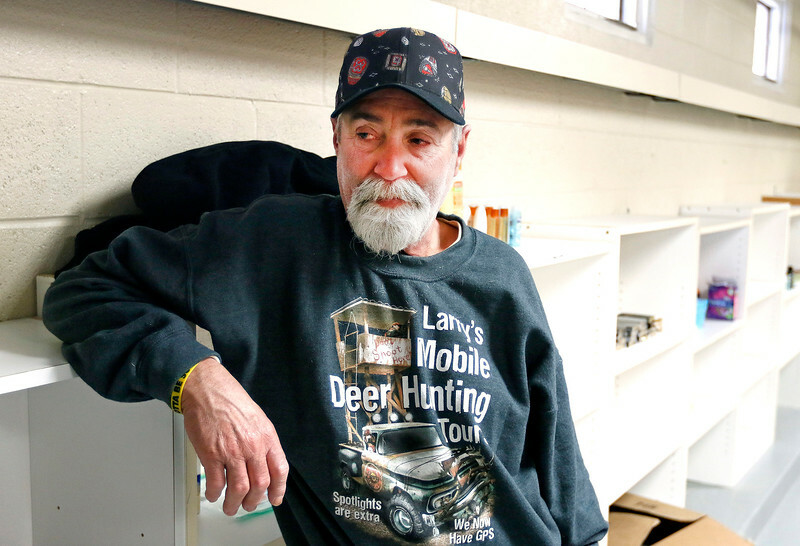 The facility is open Wednesdays from 8 a.m. to 6 p.m. and has places for homeless people to eat, sleep, shower and get services that include haircuts and meet with representatives from county service providers. H. Rick Bamman - hbamman@shawmedia.com Woodstock warming center guest Art Anderson speaks with a visitor after getting his hair cut on Wednesday, Feb. 24, 2016. The center offers the area homeless a chance to receive servicesand meet with representatives from county service agencies. H. Rick Bamman - hbamman@shawmedia.com Wodstock warming center guest Greg Fairbanks heads to the showers on Wednesday, Feb. 24, 2016. Afterward, Fairbanks had his hair cut by stylist Erica Zarnstorff. H. Rick Bamman - hbamman@shawmedia.com Pastor Tom Rogers of Redeemer Lutheran Church in Woodstock greets a visitor to the warming center in the old Woodstock fire house in Woodstock. Rogers and Sue Rose, community services director with the McHenry County Housing Authority started the program. 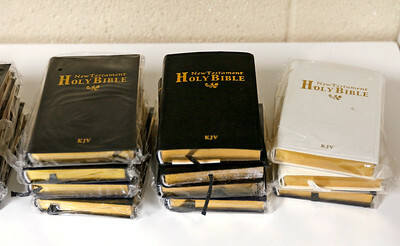 H. Rick Bamman - hbamman@shawmedia.com Personal sized Bibles along with toiletries are available at the Woodstock warming center. 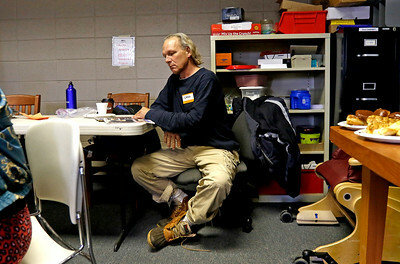 H. Rick Bamman - hbamman@shawmedia.com Woodstock warming center guest Greg Fairbanks reads a magazine while waiting for an open shower on Wednesday, Feb. 24, 2016. 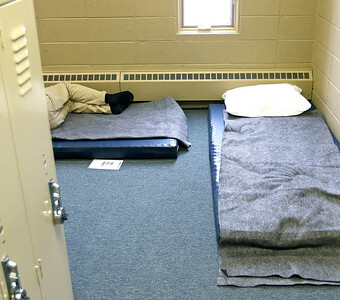 The center is open Wednesdays from 8 a.m. to 6 p.m. offers homeless people palce to to eat, sleep, shower and receive services including haircuts assistance from county service provider representatives. Woodstock warming center guest Art Anderson speaks with a visitor after getting his hair cut on Wednesday, Feb. 24, 2016. The center offers the area homeless a chance to receive servicesand meet with representatives from county service agencies.